Challenges and opportunities often can be seen as two sides of the same coin. In her address at RSNA 2013, President Sarah S. Donaldson, MD, will partly focus on seeing the coin’s opportunity side and how radiology can invest it to improve both patient care and the imaging profession. Radiology Today asked Donaldson for her list of challenges and opportunities facing radiology going into this year’s annual meeting and beyond as well as why she believes they are important. Not wanting to scoop herself on the story, however, she offered only a sneak preview of some of what she’ll address on Sunday, December 1, in Chicago. We’ve taken her four selections, reviewed the annual meeting program, and compiled a list of program sessions related to those four challenges/opportunities. Why it’s important: Changes in health care, including cutbacks in federal support for research, have reduced some traditional funding sources. The profession as well as patient care will advance more slowly without the basic clinical research that drives knowledge and care forward. 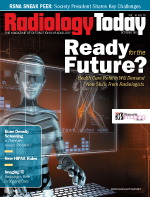 Why it’s important: The technology explosion in imaging equipment and the increasing complexity of subspecialization in radiology is changing the tools radiologists use and the skills they’ll need in the future. That presents new challenges and opportunities for training future radiologists. Why it’s important: Imaging technology helps physicians save lives, but growing health care costs threaten the US health care system. Balancing costs and providing appropriate imaging care is both a challenge to a field that has thrived on volume growth during the past 20 years and an opportunity to perhaps stave off some of the commoditization occurring in radiology. Why it’s important: The culture of medicine and radiology is starting to emphasize value rather than volume, outcomes not just output. Medical care today also is more patient driven. Partnering with patients can improve care, help radiologists be a greater part of the care team, and combat the perception of radiologists as simply service providers who read images.